Pergamon - Newly Released and an Easy-to-Learn Board Game. In 1878, the Royal Museum of Berlin commissioned excavations in Pergamon - a site in present-day Turkey. As archaeologists your goal is to get as much research funding as possible in order to finance excavations in Pergamon. You unearth pieces of antique vases, jugs, bracelets, and golden masks. Depending on the depth of your excavations, you can find remains from the first five centuries AC. By piecing together matching finds, you build collections that can be exhibited at the Pergamon Museum. The player who exhibits the most valuable collections and gains the most recognition by the museum's visitors wins the game. Ascension Storm of Souls - Newly Released. All-New Cards And Story For The Acclaimed Fantasy DeckBuilding Game. After the defeat of the Fallen God, the factions of Vigil struggle for dominance while a new threat emerges. The souls of those killed during the Great War seek vengeance upon the living. Once again, the fate of the world depends on your ability to unite mighty heroes and wield powerful weapons against a common foe. Playable as a stand-alone 1-4 player game or combine with other Ascension games to create even more wondrous possibilities with up to 6 players! A world of beautiful colors comes alive as players complete commissions that picture some of the finest European and American art works from the past six centuries. The word pastiche is used in the fields of literature and art to refer to something that is an imitation or recreation of an earlier work, often as a respectful homage or tribute to the original. In this game, players are making pastiches by mixing colors and recreating some of the palette colors used to create the original paintings of the masters. Explore the paintings, palettes and pasts of the artists in this unique and challenging game of the whole family. 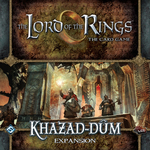 This expansion to The Lord of the Rings: The Card Game contains three new scenarios for players to compete against. Searching for Balin and his fledgling Dwarven colony, the heroes of Middle-Earth must brave the dark and infested depths of Moria. In addition to powerful encounter and quest cards, Khazad-dum includes two new Dwarf heroes. At Off The Charts Games we are excited to have in these new-to-the-market games that nicely add to the collection of games that we have to offer. Come see us at 30 NW 2nd St in Historic Downtown Gresham.